"How can I view powerpoint on ipod touch? any powerpoint viewer for ipod?" Many people are still using iPod touch nowadays, and they have taken advantage of it to do a lot of things, including playing games, watching videos and so on. iPod touch is still a very helpful utility for the users to make their life easier. When it comes to playing PowerPoint on iPod touch, people will find it not that easy. The PowerPoint files are supported by Keynote, but if you are using an old version of iWork to open PowerPoint on iPod touch, you may meet up with the formatting issues, and can’t play PowerPoint on iPod touch smoothly. So if you want to play PowerPoint on iPod touch, you need to make use of some other solutions. You can convert PowerPoint to iPod MP4 videos with PowerPoint to iPod converter program and then view PowerPoint on iPod touch. This guide would like to introduce you 2 ways to convert PowerPoint to iPod MP4 videos so as to let you freely view PowerPoint files on iPod touch and other iPod models. Open the PowerPoint files with MS PowerPoint 2010 or later. 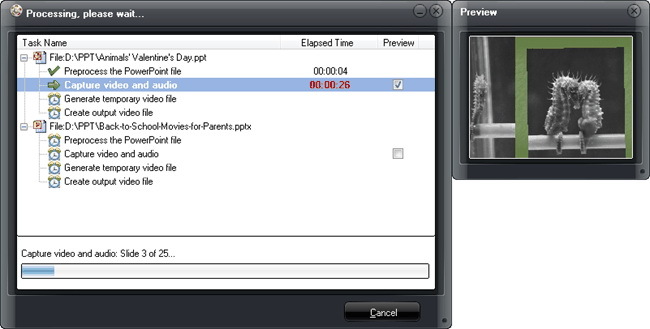 Click "File > Save and Send", and choose "Create Video". Make up settings for the PowerPoint files, and click the "Create Video" button. You will see a pop-up window. 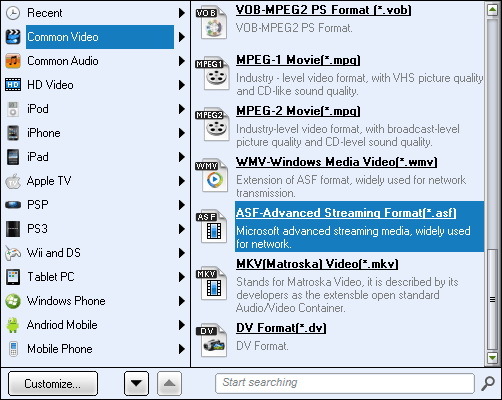 Choose a folder on your computer to save the converted video, and then click "OK". 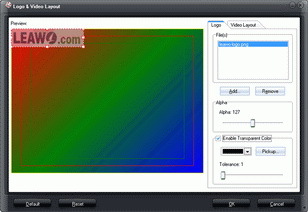 MS PowerPoint will convert PowerPoint to WMV video. If you want to play it on your iPod touch or other iPod models, you will need to either install an all-in-one video player on your iPod touch, or convert WMV video to iPod MP4 video. The two methods are both helpful on this issue, but will take some time. If you don’t want to use the MS PowerPoint to convert PowerPoint files, you can take advantage of the third-party PowerPoint converter program to convert PowerPoint to iPod MP4 video directly for iPod touch and other iPod models. 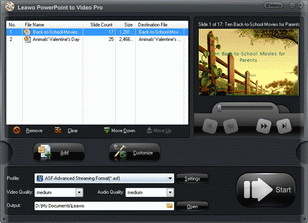 Among all the converter programs, Leawo PowerPoint to Video Pro is one of the best. Performing as a PowerPoint to iPod converter, this program enables you to convert PowerPoint to iPod MP4/MOV videos within several simple clicks, so as to let you freely view PointPoint on iPod devices on the go. 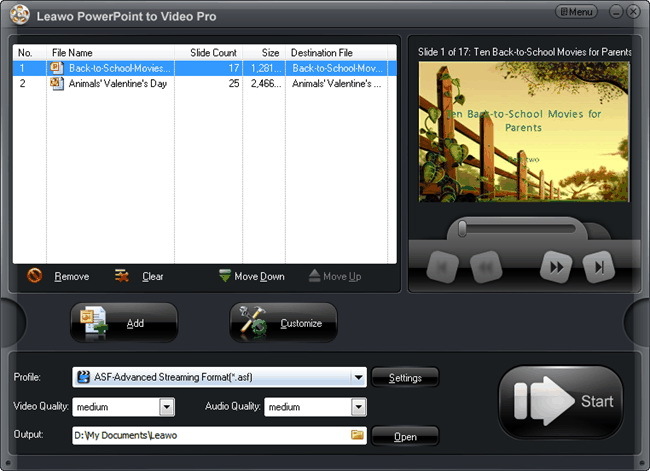 Besides the ability to convert PowerPoint to iPad MP4/MOV video, this PowerPoint to video converter could convert PowerPoint files to more than 150 kinds of standard audio and video files for nearly all media players and mobile devices. The following guidance will show you how to convert PowerPoint to MP4 for iPod touch. Download this PowerPoint to iPod converter via the above link and install it on your computer to take a try. Run Leawo PowerPoint to Video Pro on your computer, and click "Add" on the main interface to browse and import PowerPoint files you want to convert into the software. After importing, you could preview imported PowerPoint files via the internal PPT player. Then, click "Profile" button and navigate to the "Common Video" group to select MOV or MP4, or go to "iPod" group to select a proper iPod model as output. Next, set output directory in "Output"box on the main interface. 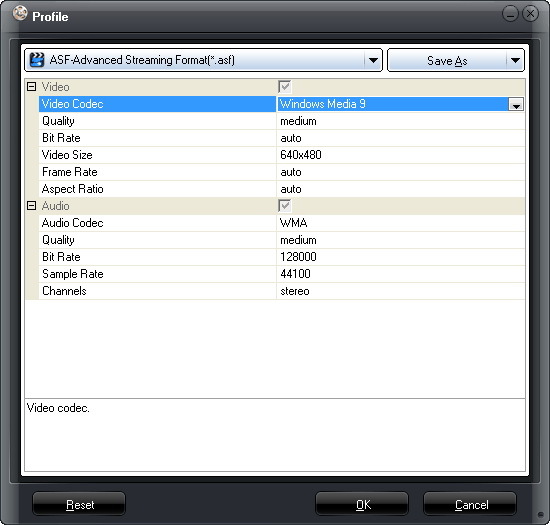 If you need, you could click "Settings" button on the main interface to adjust video and audio parameters of output videos like video codec, bit rate, video size, aspect ratio, frame rate, audio codec, channel, etc. Change these parameters according to your iPod model. This PowerPoint to iPod converter enables you to customize PowerPoint files before you convert PowerPoint to iPod MP4/MOV video: set PPT transition time, add PPT background music, set audio effect, set aspect ratio, add watermark or not, etc. Click the big "Customize" button on the main interface to do these. After customizing PowerPoint file, return to the main interface. Then click "Start" button at the right bottom to start converting PowerPoint to iPod video. Leawo PowerPoint to Video Converter Pro is a powerful converter program, and it helps convert PowerPoint for various kinds of devices. For example, you can convert PowerPoint for Samsung Galaxy S6 with this software.